Mama Kin regrets to inform you that esteemed band member Brother Michael - he of the New Orleans stomping keys and bass lines - has been injured in a motorcycle accident. Brother Michael is on his way to a full recovery, but unfortunately is unable to join Mama Kin for her national single tour to celebrate the release of Was It Worth It and introduce the new songs, sounds and band. But he insists that the show must go on. Locked down in writing and recording mode, it has been a while since Mama Kin has visited your shores and she’s primed to give you a taste of what’s to come when her new album The Magician’s Daughter lands in early 2013. 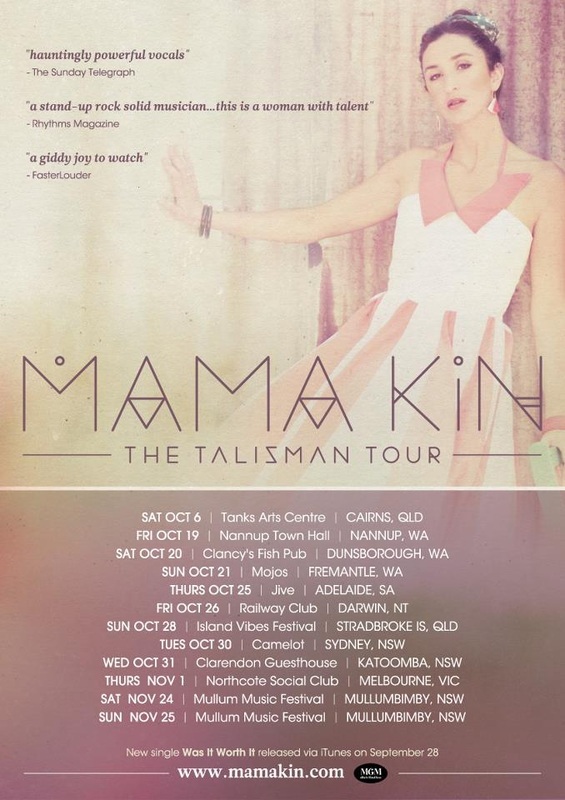 Team Mama Kin announces The Talisman Tour 2012 will now be a run of solo and intimate shows. The shows will be an opportunity for punters to re-connect, as Mama Kin showcases her new songs and old favourites stripped bare, shares some stories, and delivers a taste of the sonic shift that will reignite stages once the band returns to health. This tour is testament to Mama Kin’s commitment to her musical community.